Toilets integrated into an existing building. These are pre-fabricated modules with no special exterior finish, technical area opens on to a technical gallery. 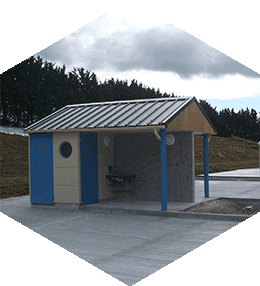 Toilet modules for the Travellers community which can be integrated into existing buildings. Highly adaptable and easily integrated into existing buildings.